Nothing feels good when we are hungry. So, why invest hours cooking when a healthy feast could be only a few minutes away? 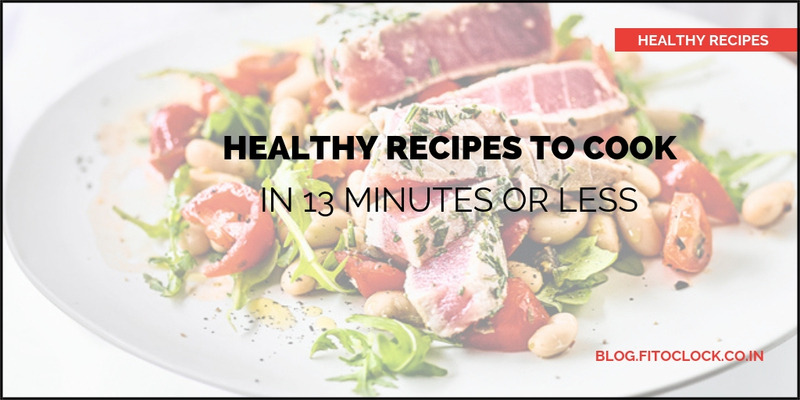 Make one of these easy recipes in under 11 minutes or less. With dripping flavors of blueberry, vanilla, cacao powder and coconut milk, this amazingly flavored smoothie is super YUM. You can make it within 5 minutes but if you are too lazy in the morning, you can simply whip this up at night and carry it on the go the next day. Simply add all the ingredients in a blender and blend until smooth. You should start your day with a solid breakfast . So, how about salad? Here’s a new improved salad recipe that you will love. Savory, easy to make, gluten-free, and SO delicious! Step 1: Poach both the eggs. Step 2: Layer the lettuce, then tomatoes, next cooked quinoa, and avocado, and pistachios on top. Step 3: Place the poached eggs on the top and add salt/pepper to taste. More of a healthy dessert, this version of microwavable blueberry muffin can be your guilt-free way to start your day. It is filled with the goodness of almond milk, flaxseed, sorghum flour and applesauce. Bake and indulge! Step 1: Add frozen blueberries, milk, applesauce and vanilla in a bowl and stir them together. Step 2: Take the sorghum flour, flaxseed meal, baking powder, sweetener and salt is a different bowl and whisk them together. Step 3: Add all the dry ingredients in the batter and stir them together. Step 4: Spray the cooking bowl with cooking spray and pour the muffin batter. Step 5: Microwave for 4 – 5 minutes. Let it cool slightly and enjoy! Looking for a classic, healthy breakfast idea? This Peanut Butter Breakfast Toast will make for a perfect post gym workout snack too. Toast bread, spread on peanut butter, sprinkle on toppings and enjoy. Step 1: Toast the bread slice. Step 2: Spread peanut butter on the bread. Step 3: Add your favorite topping and you have got yourself a healthy quick savory to devour. Museli is yum, yum, yummy! Our version is a combination of yogurt, nuts, and berries – just enough to brighten up your breakfast table and achieve your weight loss goals. 1/2 cup plain fat-free Greek yogurt, 1/2 tbsp chia seeds, 1/4 cup unsweetened muesli, 1/2 cup fresh strawberries (sliced), 1/2 banana (sliced), 1 tsp honey. Step 1: Pour the yogurt into a bowl. Step 2: Top it with the banana and berries. Step 3: Sprinkle the muesli over it. Step 4: Drizzle honey to taste. This recipe is full of protein and good fats. A great way to kick-start your day so you can be full for quite some time later. Step 1: Heat the waffle iron and grease it well. Step 2: Whisk 1 egg in a mixing bowl. Step 3: Add the grated sweet potato and a tsp oil. Mix them well. Step 4: Let the waffle iron be completely heated. Pack the sweet potato hash mixture into the iron and press it gently. Let it cook for 4-5 minutes, until lightly golden. Step 5: Take a pan with oil on medium heat. Sauté kale until slightly crispy. Step 6: Scramble egg in the same pan. Step 7: In the meantime, your sweet potato waffle should be ready. Remove them with butter knife and transfer to plate. Layer with kale, scrambled eggs and avocado. Add sugar and pepper to taste. These no-bake oatmeal bars are perfect for your lunch box. Make a big batch of these over the weekend and enjoy a week’s worth of snacks. Step 1: Melt peanut butter, honey and coconut oil together in a bowl. Step 2: Remove it from heat and add oats. Step 3: Mix the remaining ingredients. Step 4: Press into a pan and line with parchment paper. Step 5: Chill for two hours and cut into bars. It has chicken, it has hummus. It is perfect to satisfy your savory cravings post exercise at your workstation. What’s the advantage? You can add anything you want. Add the chicken and hummus in a bowl and serve on the tortilla. You can use sandwich bread, salad and cracker as variant too. Coconut pasta? Sounds interesting? Of course, it does! The recipe is basic with a twist of coconut milk added to perfection to create a unique flavor. Step 1: Add olive oil in a pan and sauté the minced garlic and chili powder until golden brown. Step 2: Add coconut milk, ground ginger, lemon juice and pepper. Cook on medium heat for five minutes. Step 3: Pour the mixture in a blender, add the spinach and blend until smooth. Step 4: Next, cook pasta by following packet directions. Step 5: Drain the pasta. Add the sauce and mix them well. You can cook it for five more minutes if you want an intense flavor. This one happens to be a classic Mexican breakfast that you can revamp for dinner. Get those tortilla chips, plenty of veggies and just the adequate dose of cheese and start cooking. No health myths attached to this one. Step 1: Whisk the eggs with milk, cumin, salt and pepper in a large bowl. Step 2: Next, pour oil in a pan on medium-high. Step 3: Add onion and jalapeño. Sauté for five minutes until soft and translucent. Step 4: Add garlic. Sauté for an additional one minute. Step 5: Add the egg mixture and cook for five minutes by stirring frequently. Let the eggs scramble. Step 6: Stir in the salsa, cheese and tortilla chips. Cook for an additional two minutes. Step 7: Add salt and pepper to taste. Garnish with your favorite topping. Skip the grumbling tummy and the cranky mood and indulge in a mouthful of delicious diet fixes.